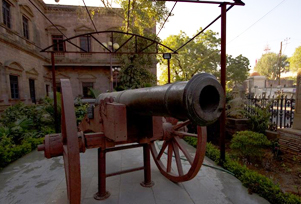 Located in the heart of the Bhuj district, Kutch Museum is one of the oldest museums of Gujarat. Museum was established in 1877 as School of Arts by Maharao Sir Khengarji III. The present structure of the Kutch Museum was built to exhibit the wedding gifts of Maharao Sir Khengarji III, then it was known as the Fergusson Museum. The stunning building of the museum is constructed in a typical Italian Gothic style of architecture by the mistris of Kutch under the supervision of state Gaidher - Jairam Ruda Gajdhar. There are 11 major galleries in the museum namely picture gallery, anthropological section, archaeological section, textiles section, weapons section, music instruments section, shipping section, and stuffed animals section. Also, there is a section devoted to the tribal community where one can see ancient artifacts, folk arts, and crafts and information about tribal people, who are a major part of Kutch's history and culture. The building of the museum consists of two floors, on the ground floor, a statue of 'Airavata' (mythological white elephant who carries the Hindu god Indra) is placed, which was made in Mandvi in the 18th century. Highlights of the museum are the oldest collection of Kshatrapa inscriptions dating back to the 1st century, coins (including Kutch local currency 'Kori') and extinct Kutchi scripts.